Two things everyone should be doing when deadlifting heavy. One, make sure you are using the thinnest bar available when going heavy on deadlifts. Many gyms have a variety of bars, all weighing 20kg but with different diameters. The thinnest 20kg bar diameter will be 28mm. But some cheaper bars go up to 30mm or 31mm. This can make quite a difference if you have small hands and /or a weak grip. Try out all the bars in your gym and find the thinnest. Two, use chalk on your hands. Chalk absorbs any sweat or moisture that is on your skin and prevents the bar from slipping in your grip. Even a small bit of slipping can make a difference when you are pulling your one rep max! If your gym doesn’t allow block/powder chalk, use liquid chalk. If it doesn’t even allow liquid chalk, you are in a gym that doesn’t understand lifting heavy weights, and you should run away as far as you can, as you will not make progress in such a place. The grip you would normally use is called double overhand. Both hands are pronated. Often this grip fails when the weight gets heavy. Usually one hand fails before the other, as one side is stronger than the other. For this reason, most lifters switch to a mixed grip, or alternate grip, when their overhand grip has run out. The mixed grip is when you keep your stronger hand in the overhand grip (pronated) but put your weaker hand in an underhand grip (supinated). This is much stronger than double overhand. If you’ve never tried it before, you will be surprised! 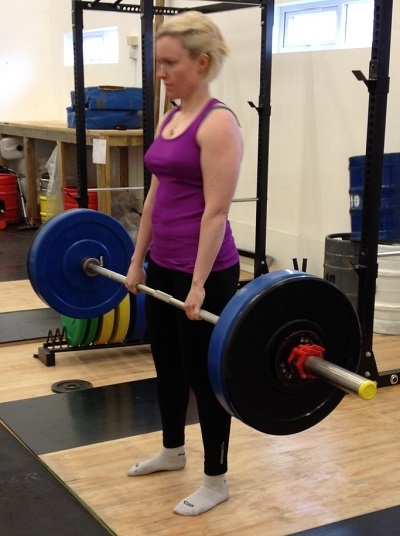 Sarah setting up for a deadlift with a mixed grip. So why don’t people just use mixed grip all the time? Well, it does put your body in an asymmetrical position. Twisting can occur when the stronger side (the underhand grip) pulls the bar closer to the body than the weaker side (the overhand side). This can result in a pulled back muscle. However, if you are vigilant about this possibility – and you are doing your rows to make your back stronger! – you should be able to prevent this happening. If your overhand side is swinging out excessively, you need to strengthen your lats and scapula retractors to keep the bar close to you. Some people consider the mixed grip more risky because it puts the bicep of the underhand side in a position more likely to elicit a bicep tear. In my lifting circles, I rarely come across this injury. However, some people on the internet (!) say it is a very common injury. Perhaps I just don’t lift heavy enough. In any case, I haven’t seen any statistics on it, so this is anecdotal. As a lifter myself, I always use mixed grip for my heaviest deadlifts, and it is something I suggest to my clients. The advice is to use overhand grip on your warm up sets and only to switch to mixed grip when you need to. At the end of the day, it is up to you what risks you want to take on when deadlifting. If you decide that you don’t want to risk a bicep tear, avoid the mixed grip and use one of the suggestions below. Hook grip is what olympic weightlifters use. It is a double overhand grip where the fingers lock the thumb onto the bar. It’s a very secure grip, suitable for the dynamic nature of the olympic lifts. However it takes some getting used to and can be quite painful on the thumb, especially with heavy reps and for weights. But it is an option to explore if you really don’t like the idea of using mixed grip. Lifting straps are a useful aid to grip. Powerlifters don’t use them often as straps are not allowed in a powerlifting competition. However, olympic weightlifters, bodybuilders and strongmen/women use them regularly as a training aid. For the regular functional athlete, I tend to recommend straps for exercises where the main target of the exercise is a big leg or back muscle, but grip will severely limit how much you can lift. Romanian deadlift or stiff leg deadlift is a perfect example. The point of this exercise is to train the hamstrings; grip strength is less important. But if you can’t hang onto the bar for 8 slow reps in the RDL, you are missing out on some good hamstring training. Straps can also be useful for platform (or deficit) deadlifts where the pull is much longer and you are doing high-ish reps.
For the normal deadlift, I’ll usually recommend double overhand or mixed grip. But if you are worried about mixed grip, straps are an alternative as your hands remain in the double overhand position. Cluster sets are sets where you have a few seconds rest between reps – anything from 10-20 seconds. This technique is used when lifting heavy weights. The rest period is not long enough to count as a separate set, but long enough to catch the breath and re-set for the next rep. Heavy deadlifts are a great candidate for cluster sets, since it is important to set up correctly every time you lift. Using cluster sets will also give your grip a mini rest between reps. If you find, for example, that your grip fails on the 3rd, 4th or 5th rep of a 5-rep set, make it a cluster set. The added benefit is that you may be able to lift even heavier, as you are getting partial recovery of the ATP-CP system between reps too. There are lots of ways to improve your deadlift grip, including just deadlifting heavy every week! Grip strength is quite specific, so if you want to improve your deadlift grip, you should do grip work that is very similar how you grip the bar in the deadlift. The type of grip required for the deadlift is a crushing/support grip. In other words, the hand fully closes around the bar and ‘crushes’ it, and there is also some grip endurance required if you are doing repeated reps. Some gyms, especially those with strongman equipment, will have a fat bar or an axle bar. This is a super thick bar (2 inches in diameter or more). Doing deadlifts with a fat bar will improve your grip. 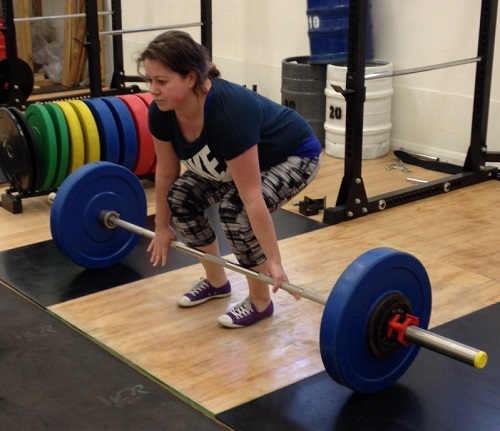 Beware, you won’t be able to deadlift your max with a fat bar! If you don’t have a fat bar at your gym, you can get a pair of Fat Gripz and put them on any normal olympic bar. Holding onto the bar for time is another way to train grip endurance. You can do double hand or single hand holds. Single hand holds are particularly useful if you have one side which is significantly weaker than the other. Working it on its own will force it to work harder! Some people recommend hanging from a pull up bar to increase grip endurance. This is less relevant to deadlifting as people tend to use their hands as a hook, meaning that you don’t require much ‘crushing’ to be able to hang from a pull up bar. The grip can be relatively loose – whereas with the deadlift you must maintain a tight grip otherwise the bar will just fall out of your hands. However, as a way to train forearm endurance, dead hangs can be part of the mix (and will probably improve your pull ups too). Farmers walk with dumbbells, kettlebells or farmers walk handles if you have access to them, are great for developing grip endurance. They are also a decent exercise in their own right, so you can get your cardio done while also training grip – kill two birds with one stone! If you’ve been working your grip, take a few minutes to stretch your forearms and fingers afterwards. If they get tight too often, you’ll end up with pain around the elbow.